Seagate has launched what they are claiming is the worlds first 1.5TB portable external hard drive, the Seagate FreeAgent GoFlex. 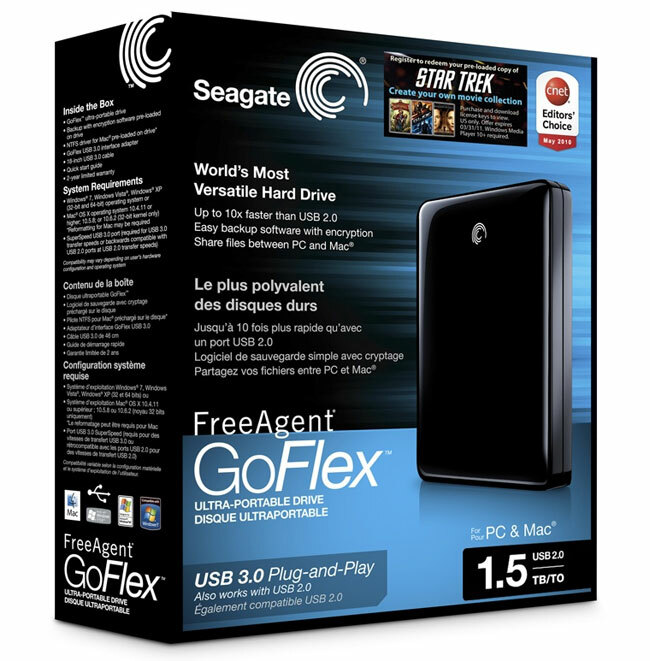 The Seagate FreeAgent GoFlex is compatible with both Mac and PCs and it comes with a USB 3.0 connection, which is backwardly compatible with USB 2.0. According to Seagate, this new hard drive is capabale of transfer speed of up to ten times that of a YSB 2.0 drive, and can transfer 25GB of data in under five minutes. The Seagate GoFlex 1.5TB portable hard drive is now available for $249.99 from Seagate. SCOTTS VALLEY, Calif. — September 21, 2010 — Designed to address the explosive worldwide demand for digital storage, Seagate (NASDAQ: STX) today launched the world’s first 1.5 terabyte (TB) 2.5-inch portable external drive. Available immediately, the new 1.5TB FreeAgent® GoFlex™ ultra-portable drive delivers an all-in-one, technically advanced solution to help store, share and enjoy libraries of digital content in one’s preferred medium—whether on a Mac or PC, or a television, at home or on the go. With 1.5TB of capacity people can now store and carry up to 60 HD movies, 750 video games, thousands of photos or tens of thousands hours of digital music. Shipping now in the United States and rolling out globally later this year, all 1.5TB GoFlex ultra-portable drives1 will ship with a USB 3.0 interface cable, accelerating the transfer speed of a drive up to 10x when connected to a USB 3.0 port, when compared to a USB 2.0 port. For example, a drive using a USB 3.0 connection can transfer a 25GB file in under five minutes versus the 14 minutes it would take using a traditional USB 2.0 drive2. In addition, all GoFlex ultra portable drives will now also ship with the new superspeed USB 3.0 cable, which will still continue to work with existing USB 2.0 ports. A key addition to the GoFlex™ family, the new 1.5TB GoFlex ultra-portable drive delivers ultimate flexibility in how people collect, protect, share and enjoy their digital libraries, all in a convenient compact package. In addition to coming bundled with USB 3.0 connectivity, the drive can be used with an array of add-on cables and accessories such as the GoFlex™ Net media sharing device and the GoFlex™ TV HD media player, that provide the flexibility to enjoy your content on a TV, a network, using a mobile device, or via the Internet. All 1.5TB GoFlex ultra-portable drives are compatible with both the Windows® operating system and Mac® OS X computers. Each drive includes an NTFS driver for Mac, which allows the hard drive to store and access files from both Windows and Mac OS X computers without reformatting. The NTFS driver is simply installed once on the Mac® OS X computer, allowing it to read and write files on a Windows formatted4 drive. The 1.5TB GoFlex ultra-portable drive with USB 3.0 adapter is available in black and can be purchased on Seagate.com and through select retailers for $249.99.